Smile is the best jewel that we can have and gift anybody. A smile symbolizes positivity and a healthy smile symbolizes a healthy body. A smile can lift up a bad mood and we can feel actual happiness, joy, amusement just by putting a smile on our face. Scientists reveal that smiling on purpose can change the brain chemistry and helps to develop good thoughts. Smile can help in building good relations with people and can also help people help people dealing with anxiety and depression. People with beautiful teeth, especially those who have front row of healthy incisors are more inclined to smile. Toothless fellows are often hesitant to smile in a group as they are always disregarded. When such importance is given to smiles in our society, dental implants are a blessing to all toothless folks. A dental implant is a surgical component which is placed in the jawbone and fuses with the jawbone within a span of few months. A dental implant is basically a replacement for a missing tooth. It is considered as a standard treatment for prosthetic replacement in dentistry. While the conventional dental implants need several implants, there other dental implants that have a shorter treatment time. 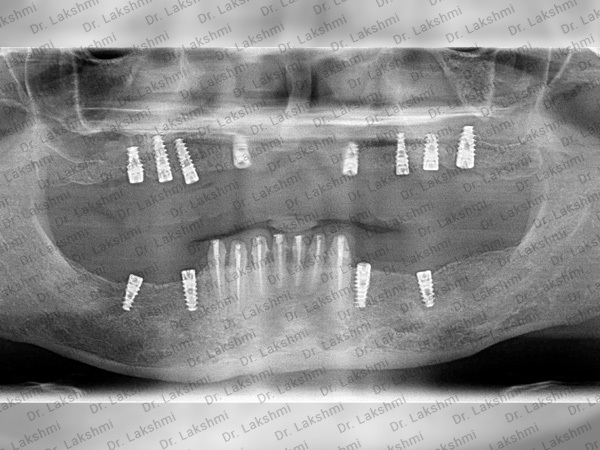 One such dental implant is all on 8 dental implant. In this implant procedure the back teeth implants are tilted so that doctors can take maximum advantage of the dental bone. This procedure is suitable for every bone condition except for severe bone loss condition. In this implant procedure, eight implants are placed on each dental arch. These implants act as an anchor for a non-removable dental bridge. The treatment is recommended to people who have lost 80% of their natural teeth. The implant fuses with the jaw bone giving natural looking teeth. Can be done for all bone qualities. No slipping, dropping and irritation like dentures. Painless procedure of short duration. Patients can eat all types of food again. This permanent implant is more comfortable than removable denture. These implants give the feeling of natural teeth that you can brush easily. There is no need for removing and you can eat all kinds of food with ease. No one Would ever know that you have had a dental implant. A big shout out to all the toothless folks who have been hesitant to go for a dental implant considering the pain and complexity. The dental implants have become a simple that gives you natural looking artificial teeth. After the dental implant procedure you can show off your billion dollar anytime and anywhere. Let’s spread the smile! !